You know what it's like when you get back from vacation... There's unpacking to tend to, endless laundry, grocery shopping to do and the business of life to get back to. Sigh... I haven't had time to get my stamp groove on, so I thought I would share some of my favorite pictures from our trip. Keep in mind this is my top 5 out of about 200, so I've narrowed it down quite a bit for you (*wink*). 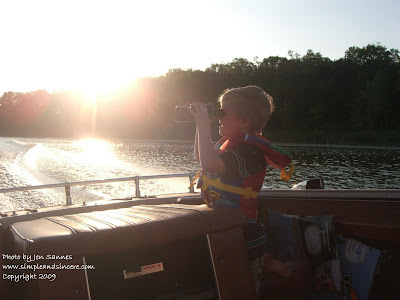 Jevin, on the boat, using the binoculars. I don't know if he could actually see anything with them, but he and Enavi sure liked using them. 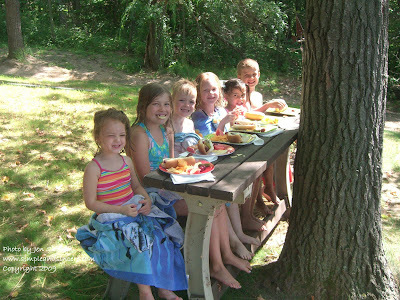 Here are the cousins, all lined up, eating lunch. Six kids, one per year, ages 3 to 8. They had so much fun playing together and they all got along! 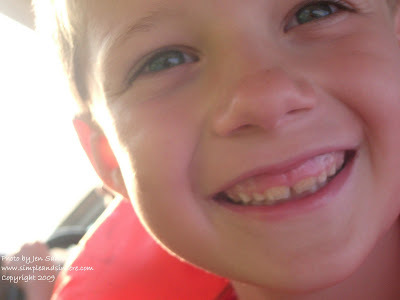 This is my nephew, Tovin, who is 7. I just love this picture of him - what a cutie! This is Enavi and Jevin at Looney Days in Vergas, Minnesota. 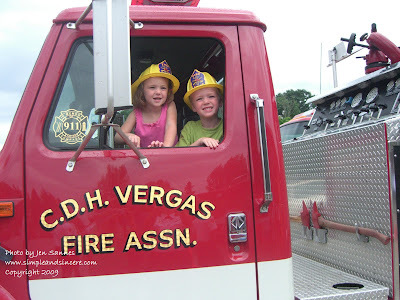 Their fire station has THE BEST open house - the kids can climb into all of the different vehicles, try on the fire fighter gear, jump around in the jumpy house and receive complimentary helmets, coloring books and stickers. Definitely worth the trip! If you know me, you know that I'm kind of a sunset fanatic and one of my absolute favorite things about Rose Lake is the amazing sunsets. 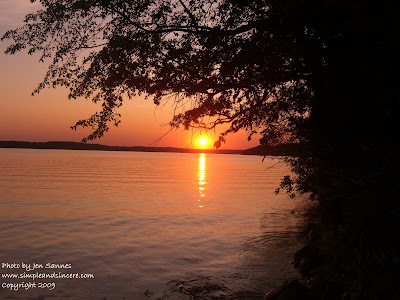 We had fantastic weather while we were there and I saw several sunsets that were just as breath-taking as this one.